The Egyptian Mau... The Oldest Cat Breed? Discover the Exotic Egyptian Mau, a wild looking, but very sweet breed. Domesticated by the Egyptians, the Mau may just be the oldest breed of house cat. They also have the distinction of being the only natural spotted domestic cat breed. If you've always wanted to own a wild cat, you may want to take a close look at the Egyptian Mau. This cat, which is descended from cats that lived in ancient Egypt, is believed to be closely related to the African Wild Cat. 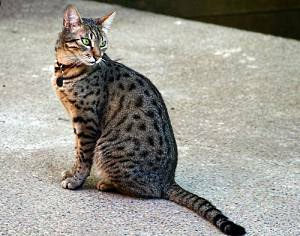 When you look at a Mau, you are looking at the same spotted wild cat that the Pharaohs in ancient Egypt domesticated and kept as pets and objects of worship. Surprisingly enough, this descendant of the Egyptian cat did not reach the United States until the nineteen fifties, when an exiled member of the Russian royalty brought her Maus with her to the United States. For several decades, her two cats were the ancestors of all Egyptian Maus in North America. Recently, however, concerned breeders finally imported additional cats to prevent hereditary diseases and to widen the gene pool. The Egyptian Mau is a bit on the small side, weighing in at a fairly lightweight five to eleven pounds. Due to their wild-looking spotted coats, Maus are an excellent alternative if you're considering adopting one of the hybrid cat breeds. This breed has a wedge shaped head that looks a bit small for its muscular, sturdy body and a graceful tail that is approximately two thirds the length of its body. These cats have small, dainty paws and move with a jungle cat's walk. The recognized colors are smoke, silver tabby, and bronze tabby. All of these cats have a spotted appearance. Occasionally, black cats are produced, but they cannot compete in the Cat Fancier's Association's Championship classes. The shape of the Mau's eyes and mouth give it a slightly startled and worried appearance, but this cat is actually quite a happy go lucky breed. Interestingly enough, these cats actually look as though they have kohl rimmed eyes, just as the ancient Egyptians did. If you are not fond of the typical cats meow, you will probably enjoy the Mau's vocalizations. This breed often communicates with a noise that sounds like a little chuckle or chortle instead of a cat's normal, more harsh meow. This quiet, pleasant sound makes this breed the perfect apartment pet. If you do keep a cat in apartment, make sure you set up a cat sanctuary area and make good use of vertical space. You also may want to leash train your Mau so you can go for walks. In addition, while most cats wag their tails when agitated or excited, these cats actually wag their tails in a dog like manner when they are happy. They are known for displaying rapid tail movement while paw treading (kneading) and vocalizing. Maus get very attached to their owners. They love their families and are very protective of them and devoted to them. These intelligent cats are considered to be "moderately active" but they are very playful and enjoy human interaction. They're also very speedy, and considered the fastest runners of all domestic cats. You'll need to have plenty of toys on hand to keep them happy. Interactive cat toys are a great way to spend time with your pet, relieve boredom, and increase exercise levels. If you cannot spend a lot of time with your cat, you may want to add a second cat to your home. This breed's loyal and affectionate nature makes it ideal for multiple cat households. Since this is a shorthair breed, you do not have to spend a great deal of time grooming your cat. You should plan to groom him, however, at least once a week to remove loose hair and debris. Since cats can develop serious health problems from tooth decay and tartar, you should also accustom your kitty to having his teeth brushed several times a week. It's been found that dental problems can start as early as 3 years of age. To some, the Egyptian Mau is the perfect cat breed. Why? If ancient Egypt is the true origin of the domestic cat, then that makes the Mau the likely candidate for the oldest domestic cat breed. This makes them, by heredity, the most accustomed to human contact and, by some estimations, the best companion. If you want a cat that looks wild, but is actually a sweet and loving animal, then you may want to consider owning an Egyptian Mau. If you don't want to show your Mau, you might want to look at adopting a rescue cat. Unfortunately, purebred cats do end up in shelters, more often than you might think. Another way to live with a Mau is to get a pet quality cat, which may differ only in color from the show quality. In addition to the three colors that Egyptian Maus can be shown in, Maus can be found (and registered) in Solid Black, as well as the dilute coat colors of Blue Silver, Blue spotted (dilute bronze), Blue Smoke and Solid Blue.